For a quick nutritious supper, all you have to do is make sure to have dried spaghetti in the cupboard, and eggs, bacon, and cheese in the fridge, with a head of lettuce for a salad and fresh fruit for dessert. 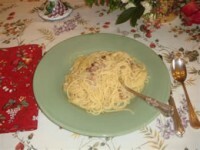 This Spaghetti Carbonara will be welcome comfort food during the holidays or on a cold winter’s night. I always break the pasta in half before putting it in the pot, and be sure to save some of the pasta cooking liquid to add if the Carbonara starts to dry out. The trick is to rush the pasta to the table on warmed plates. Buono Gusto! 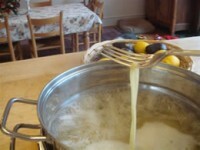 To cook the spaghetti, put a large pot of boiling water over high heat. When the water is boiling, toss in half a teaspoon of salt with the spaghetti. Stir to keep the spaghetti from sticking. Cook for 7 or 8 minutes, until a piece of spaghetti tastes cooked, or “al dente”. In the meantime, melt the butter in a large frying pan over medium-high heat. 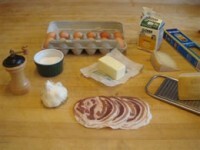 Stir in the pancetta and cook until it starts to brown. Reduce the heat to low and stir in the garlic. Let the garlic cook for a few seconds, then add the cream. 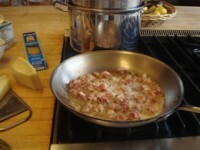 When the pasta is cooked, drain it and add it to the frying pan with the pancetta mixture. 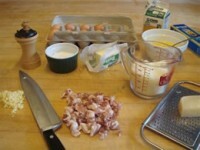 Turn off the heat and stir in the eggs and cheese to coat the pasta. 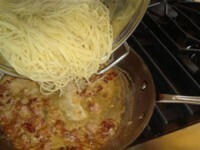 Season the spaghetti with salt and garnish with pepper and serve immediately.